You’ve suddenly noticed one of your teeth looks and feels uneven, and it may even appear chipped. To make matters worse it’s right in front in the “smile zone” — when you smile, everyone else will notice it too. You want to have it repaired. So, what will it be — a porcelain veneer or crown? Maybe neither: after examining it, your dentist may recommend another option you might even be able to undergo that very day — and walk out with a restored tooth. This technique uses dental materials called composite resins. These are blends of materials that can mimic the color and texture of tooth structure while also possessing the necessary strength to endure forces generated by biting and chewing. A good part of that strength comes from the way we’re able to bond the material to both the tooth’s outer enamel and underlying dentin, which together make up the main body of tooth structure. In skilled, artistic hands composite resins can be used effectively in a number of situations to restore a tooth to normal appearance. While veneers or crowns also produce excellent results in this regard, they require a fair amount of tooth alteration to accommodate them. Your dentist will also need an outside dental laboratory to fabricate them, a procedure that could take several weeks. In contrast, a composite resin restoration usually requires much less tooth preparation and can be performed in the dental office in just one visit. 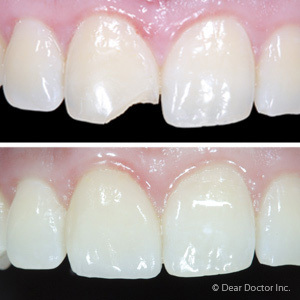 Composite resins won’t work in every situation — the better approach could in fact be a veneer or crown. But for slight chips or other minor defects, composite resin could transform your tooth’s appearance dramatically. To see if composite resin is a viable restoration option for your tooth, visit your dentist for a complete dental examination. It’s quite possible you’ll leave with a more attractive tooth and a more confident smile.